What to do at wintertimeat Ibiza? The best wintertips! Summer is over. We’ve had a lovely autumn at Holland and as well as at Ibiza. Till half of October the island was still visited by a lot of tourists. And after that the island will get back it’s own peace en the winter season starts. The locals own their island again for about six months. At September you have all the closing parties from all beach clubs and clubs at the island. Most of them will close their doors for wintertime in the first week of October. By the end of October almost everything is closed, except for a few. 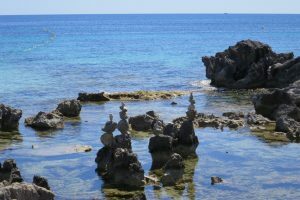 The island will get back it’s own peace, and you are able to enjoy the other side of Ibiza. But there’s still a lot you can do. Although you can enjoy all the beautiful sides from the island in summer and the whole year, autumn and winter are extremely suitable to enjoy the beautiful nature for the ones that love the peace and happiness from the island. Nature is beautiful all year at Ibiza. The beautiful beaches and little bays look amazing in this time of the year as well, but just a little different than in summertime. No sunbeds, only beauty and a peaceful environment. Also this side of Ibiza gives me joy and a great feeling of happiness. The temperature is lovely from October till December. It’s about 20 degrees at daytime, so your able to do a lovely walk on the beach, or just sit-down on the side en just enjoy the lovely views. In the evenings it will be colder, because of the high humidity, it feels colder than it really is. I definitely can recommend a wintertrip to Ibiza! Isn’t it great to escape from the lower temperatures in your own country, and just enjoy 20 degrees in your shirt at daytime? The sun will show it’s face also enough in this time of the year. Although I can tell you it also can rain cats and dogs at Ibiza. At October you will see a lot of people leave the island for wintertime. Most beach clubs will close and you see people are preparing everything for their absence during winter. The hippy markets “Las Dalias” and “Punta Arabi” are still open this month. Las Dalias will be open in wintertime as well on Saturdays. And there are some beach clubs that will be open the whole year round. At November you will get to know the real Ibiza in wintertime. 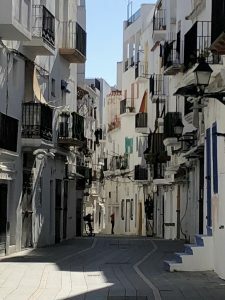 The little streets at Ibiza town around the harbour and at Dalt Vila are lonely. But it’s still very charming! I can tell you they still look beautiful, and it’s still fun to walk around. Although I also have to tell you that some areas look a bit poor. A lot of hotels are closed in wintertime as well, and the windows are closed with some kind of whitewash, and the doors are locked with wooden boards. But here and there you will find some terraces where you still can enjoy the sun while having a drink. The beaches are empty, but the sea still looks beautiful! You are able to enjoy the most beautiful sightseeing spots without a lot of other tourists around you in this time of the year. You can enjoy all the beauty that the island has to offer in peace. And because of that peace you will be relaxed and get your rest. Also now you will see the most beautiful sunsets, nice little roads, and the beautiful mountains. At the end of January the almond trees will get their flowers, you will find a lot of them, and they are so beautiful in that time of the year. Also in March it’s still very peaceful at the island. But the nice thing in that time of the year is you will see the island waking up slowly from it’s winter sleep. Spring starts of course, but you will also see that people start preparing everything for the upcoming summer. They start to paint their beautiful white buildings and houses, and the hotels will start to prepare their opening season as well. 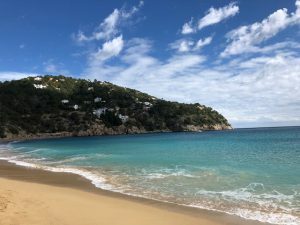 What to do in wintertime at Ibiza? Ibiza is fun, also in wintertime. Dalt Vila is beautiful, maybe even more beautiful in al it’s quietness and it’s very nice to take a walk over there. The bars and restaurants are closed in this time of the year in this area, but at it’s streets around it, the Plaza del Parc for example, there will be some bars that are open, where you can have a good time to relax. At Santa Eularia a lot is closed as well, and I know that this winter a part will be closed down because of construction. 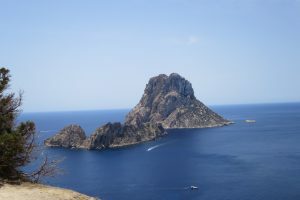 Of course you have to go and see Es Vedra in this time of the year as well, and like I said before make your own island tour. Explore the island!! Same thing goes for Formentera, which you van visit in wintertime as well. The ferryboats go all year long. 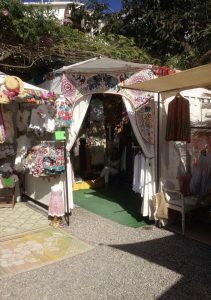 The hippy market “ Las Dalias” will be open every week on Saturday from 10.00-18.00. About half of December they will organise a Christmas market as well till the beginning of January. The flee market at Sant Jordi will also be organized all year round every week on saturday. There will be a lot of other activities in wintertime as well. Agroturismo Atzaro is good in organizing events in wintertime for example. 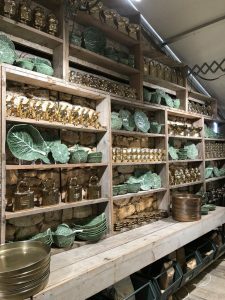 Sluiz is one of the best known shops where you can find great stuff and decoration for your house, and they are open in wintertime as well. And they as well do organise different nice events. But even without an event, spending your afternoon in this shop is already a little party! Go to Casita Verde, they are open every sunday from 14.00-19.00. It’s nice if you want to do something else for a change. You can enjoy some nice fresh juices and bites. Everything in totally ecological style of course. And between 14.00 and 16.00 the serve a vegetarian lunch. Besides all this you can see what can be done with recycled materials like bottles or aluminium cans. There are alternative habitations like a tree house for example, or a house from bottles. Join a local walk together with a guide and explore the island in another way. And of course you can do lovely walks at the beach. Great beaches to walk in this time of the year are Ses Salines and Es Cavallet. Or the beach at Playa den Bossa in direction of Ibiza town. And if you want to enjoy a great lunch next to the beach than go to Es Cavallet and visit La Escollera. 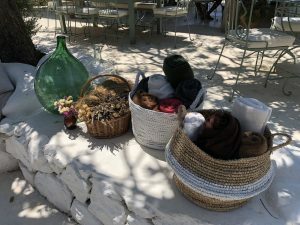 Cotton Beachclub at Cala Tarida will be open in wintertime as well. A lot of hotels are closed in wintertime, but some are open the whole year round. And…did I convince you to visit Ibiza in wintertime as well? In springtime as I mentioned as well, it’s great to be at Ibiza as well. I can recommend to visit in that time of the year as well. Do you prefer summer at Ibiza? Keep following my webpage, instagram and facebook page. Because I will keep giving you tips about where to stay, nice beaches, restaurants and special offers to get you a great Ibiza experience. I will also write about special occasions and events on the island.